Cathleen is an associate at Ward Damon and she concentrates her practice in the areas of commercial lending, real estate, contracts and corporate law. In this capacity, she represents financial institutions and business owners and their representatives in a variety of matters. 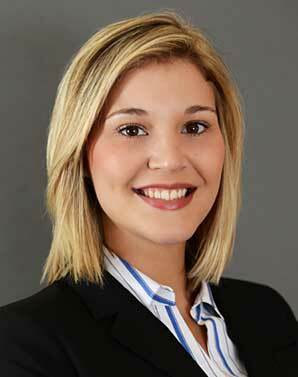 As a closing attorney for commercial lenders, Cathleen prepares and reviews loan files for conventional commercial loans as well as SBA 7(a) and 504 loans, advises loan officers and processers, and drafts, analyzes and negotiates loan and finance documents. Cathleen has experience reviewing due diligence materials and drafting and negotiating loan documents for a variety of transactions, including asset purchases, stock purchases, construction loans, refinancing, working capital loans, equipment purchases, and real estate acquisitions. She has assisted and closed many commercial finance transactions, from start-up business transactions to complex business and real estate acquisitions. At the corporate level, Cathleen provides guidance for businesses on corporate structure, such as entity formation and corporate governance, and other general business matters, including licensing, sales, mergers, and acquisitions. She has acted as corporate counsel in a variety of industries, including the technology industry, in which she has experience preparing privacy policies and user agreements, as well as development agreements for software applications, and the citrus industry, involving the preparation of licensing and sublicensing agreement with a variety of local and international agencies, variety developers, propagators and growers.